Dissolve the yeast into 1/4 cup warm (about 125ºF or the same temp as a warm bath) water with 1 tbsp sugar. Bring the milk to boiling over medium-high heat. Stir frequently. Remove from heat and add cold butter to bring the temperature of the milk down quickly. Stir occasionally as butter melts. Milk needs to cool to about 125ºF (think warm bath water). While the milk is cooling, beat the eggs and 1/2 cup sugar in the bowl of a stand mixer. Add the yeasty water, the warm milk-butter mixture, the salt, and 4 cups of flour to the mixing bowl. Use the bread hook to mix and knead. Once a sticky wet dough has formed, add more flour (by 1/4 cup at a time) until the dough is pulling away from the edge of the bowl (but still slightly sticky). Cover and set aside. Mix together the 1 cup brown sugar with the cinnamon. Set aside. Roll the dough into a large, thick rectangle (about the size of a 9x13 baking dish). Brush 1/4 cup melted butter over the rectangle. Sprinkle the brown sugar mixture on top. Roll the dough, starting at the long side. Slice into 9 pieces. Place them cut side down into a well greased 9x13 baking dish or sheet. Cover and let rise on a warm heating pad until doubled in size. Meanwhile, preheat oven to 375ºF. Make the icing: vigorously whisk together the melted butter, powdered sugar, vanilla, and milk until a smooth icing forms. 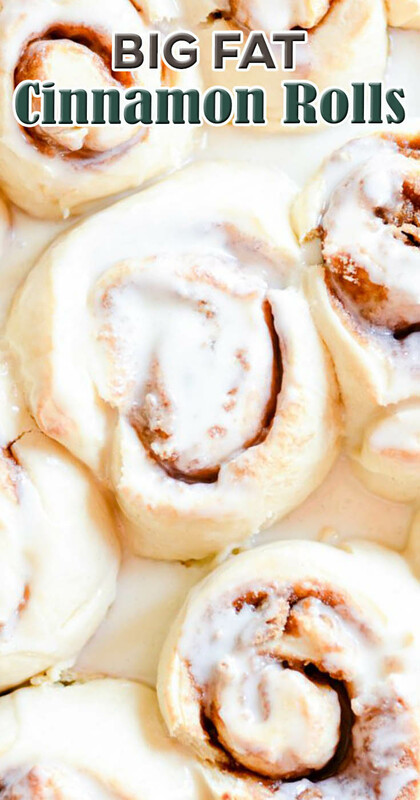 Drizzle over cinnamon rolls before serving warm.